Why You Should Choose This Platinum Fareham Apex Workshop for Your Garden. It’s important when buying a new garden wooden workshop that you spend your money wisely and these buildings demonstrate top value and super strength combined, which is a great combination. Built to the very high standard of the Southampton range they are just 4 inches lower but in every other way the same. This ensures you can obtain a marvellous high spec building at a great price. These buildings even look strong and will pass the test of time with flying colours. And all the time you can be enjoying the feeling of a great garden workshop around you and gaining satisfaction in your choice. If you are looking for a superb high quality built wooden workshop made using the best materials and with attention to details then these Platinum Fareham Apex garden workshops should fit the bill. These buildings are probably some of the best workshops which we have offered over the last 20 years. Not only constructed solidly the attention to detail is amazing. 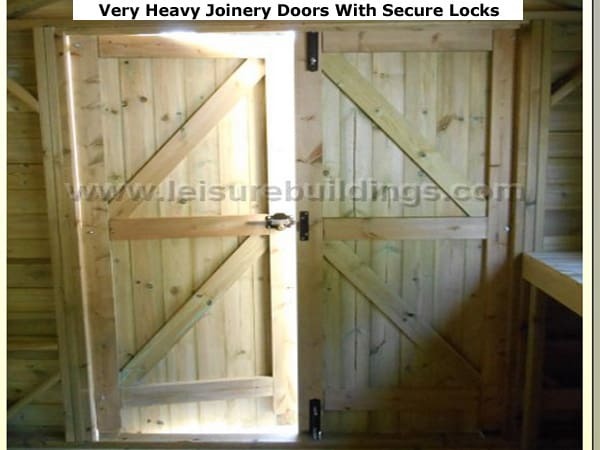 As standard you will find barn like joinery made double doors with high-security locks, there are wraparound corner strips to protect the end grain of the timber from the elements, significant diagonal bracing as well as vent in the soffits – to allow a good flow of air through these garden buildings. Constructed solidly in a range of T&G redwood deal (NOT inferior whitewood) claddings from 15mm through to 20mm (finished thickness) and combined with 19mm (15mm finish) floors and 16mm (12mm finish) roof – which is covered with Onduline Boarding for long life. When you consider than most wooden workshops are made from whitewood and 12mm (finish) floors and roofs with OSB such as Tunstall Garden Buildings and other companies you can appreciate the great value these buildings offer. Available to view before buying giving you great peace of mind so you can be the judge of the high quality lavished on these buildings. Besides the vast array of special features as standard another positive on these workshops is the ability to have it built to suit your needs. Whether you want extra doors or windows, whether you want the doors and windows moved or have a partition added these wooden workshops can fulfill those roles. This also applies to the size of the building which can be made to suit the space you have got rather than having to settle for second best. To really appreciate the quality of these garden workshops (or any other one for that matter) you should take the opportunity to view. Whereas most Internet retailers don’t offer an opportunity to view before buying you will find that ‘1st Choice’ does. With their garden storage workshops display rooms, near Guildford and Farnham you can see these buildings and their qualities for your self. It will become apparent the attention to details which most companies don’t bother with. Why don’t these internet companies bother with show sites? Well, they may feel that a flashy web site or colour brochure is enough but I feel nothing beats seeing one ‘in the flesh’. So where ever possible try to view before buying or at the very least deal with companies which have the confidence to show their products beforehand at a show site like these ones. You then know you are buying with confidence that you know what you are buying and have peace of mind whilst waiting for your new garden workshop to arrive. Assembling a storage workshop or timber workshop is hard work – that’s a fact. It’s also important for the long life of your building that it’s assembled correctly and if you do it yourself the responsibility for this is yours. All the Platinum Fareham Apex workshops are assembled free of charge to save you the worry – how good is that? You know it will be built correctly and that your new building will stand up to all ‘Mother Nature’ throws at it. Take advantage of this service and enjoy those hours with your feet up. If you really want to build your building yourself we do offer a discount. Delivery is also included in the prices to most of England mainland, so no nasty surprises with your final bill.